Proudly using the Vestibular Technologies CAPS™ machine to help you regain your balance….for life. If a patient’s body has a misrepresentation of verticality, this altered verticality causes impaired proprioception and affects the bodies’ center of mass, making the patient susceptible to falls. 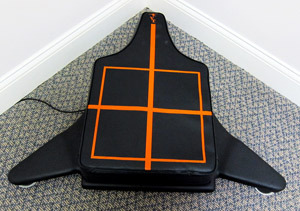 The Vestibular Technologies CAPS unit measures postural sway by calculating a number of variables such as sway area, velocity, direction, and frequency. Sway increases with aging, more so in the elderly that fall. Sway also increases in various neurological conditions affecting the sensory and motor systems including, multiple sclerosis, Parkinsons Disease, cerebellar disease, stroke, and peripheral neuropathies. A CAPS analysis benefits everyone from seniors to athletes. Using our Vestibular Technologies CAPS™ machine, Dr. Saponara will determine if you are at an increased risk of falling and if any balance problems are triggered by specific positions or activities that would otherwise go undetected. This gives a clear picture in determining where your body perceives itself in space. The real-time diagnostic results allow Dr. Saponara to immediately identify issues and customize a rehabilitation program for you. evaluate the effects of drugs, manipulations, etc. help you improve symmetry and posture. serve as a rehabilitation tool. establish if you are at risk of losing your balance one reaching a fully erect position after rising from a sitting position. learn different strategies to perform the sit to stand motion. as a rehabilitation tool, it can provide invaluable training in terms of optimizing the maximum load on your lower extremities.